Scientists at a Massachusetts company seeking to make pig organs safe enough to be transplanted into humans have used gene-editing technology to clone piglets that lack a potentially dangerous retrovirus, according to a study released on Thursday. The clones, which were born without the retrovirus, will be monitored for long-term effects from the procedure. “This research represents an important advance in addressing safety concerns about cross-species viral transmission,” Luhan Yang, co-founder and chief scientific officer at eGenesis, said in a statement. 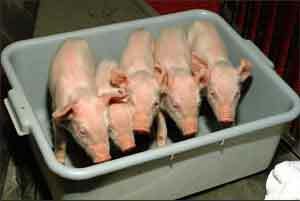 Pigs have long been seen as a viable source for organ transplants to humans because their organs are similar in size. Scientists have specifically studied the potential for transplanting swine hearts, kidneys, livers and lungs. Scientists in decades past experimented with transplanting chimpanzee organs into human patients but turned their focus to pig organs instead after finding them to be more suitable donor candidates. One key remaining obstacle is how to produce pig organs that, once transplanted, will not produce an immunological rejection in human patients an issue also under study by eGenesis scientists, the company said.